The first manned, untethered flight took place in a Montgolfier Hot Air Balloon on November 21, 1783 from the Château de la Muette, Paris with two volunteers, Jean Francois Pilatre de Rozier and Francois Laurent, Marquis d’Arlandes, as passengers who became the first humans to fly. 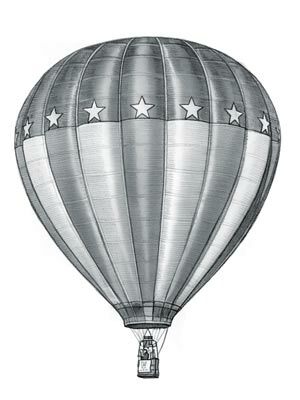 Definition of the Hot Air Balloon: The Hot Air Balloon is defined as a lighter-than-air craft consisting of a very large bag (balloon) filled with heated air or a gas lighter than air designed to to rise and float in the atmosphere allowing passengers to travel through the air in a basket (gondola) suspended below the balloon. Fact 1: Who invented the Hot Air Balloon? The Hot Air Balloon was invented by Joseph and Jacques Montgolfier in 1783 during the Industrial Revolution era of inventions (1700 - 1860). Fact 2: Who invented the Hot Air Balloon? Prior to the invention of the Hot Air Balloon in 1783, men had dreamt of being able to fly through the air. The Ancient Chinese invented paper and used this to create their famous spherical paper lanterns. Fact 3: Who invented the Hot Air Balloon? The Chinese went on to fill the small paper lanterns with hot air which caused the 'sky lanterns', made from oiled rice paper on a bamboo frame, to float in the sky. Chinese Sky Lanterns were used for military signalling during the Three Kingdoms Period (220-280AD). Fact 4: Who invented the Hot Air Balloon? European chronicles detail the use of hot-air balloons, shaped like dragons, either for signalling or as standards by Mongol invaders at the Battle of Liegnitz in 1241. Fact 5: Who invented the Hot Air Balloon? The Italian Renaissance genius Leonardo da Vinci (1452-1519) designed flying machines including the Ornithopter, a helicopter and a light hang glider but although he understood the rising force of hot air - he never thought of creating a hot air balloon. Fact 6: Who invented the Hot Air Balloon? In 1709 Bartolomeu Lourenco de Gusmao, a Brazilian priest and inventor, experimented with creating the first unmanned airships, which he demonstrated to the Portuguese court. Most of the Bartolomeu Lourenco de Gusmao airships were uncontrollable and went up in flames. Nearly 75 years would pass until Joseph and Jacques Montgolfier would invent the hot air balloon in 1783. Fact 7: Who invented the Hot Air Balloon? The parents of Joseph and Jacques Montgolfier were Pierre Montgolfier (1700–1793), a prosperous paper manufacturer and Anne Duret (1701–1760). The brothers were two of the sixteen children in the Montgolfier family and were raised in in Annonay, in Ardeche, France. Fact 8: Who invented the Hot Air Balloon? The inspirational, careless and energetic Joseph Montgolfier was the eldest of the two famous brothers and was born on August 26, 1740. The serious, efficient and businesslike Jacques Montgolfier was born on January 6, 1745. Fact 9: Who invented the Hot Air Balloon? The Montgolfier brothers were both well educated. Joseph was the dreamer and developed a passion for inventions and aeronautics. Around 1775 Joseph Montgolfier built his own parachute, and once jumped from the family house, to the horror of his father. Fact 10: Who invented the Hot Air Balloon? Joseph Montgolfier then began to dream of creating a flying machine. At this time his sensible brother, Jacques Montgolfier, had taken the responsibility of running the family business. Fact 11: Who invented the Hot Air Balloon? In 1782 Joseph Montgolfier had the idea that would lead to the invention of the Hot Air Balloon. His 'Eureka' moment came when he was looking at laundry drying over a fire and observed that pockets were formed that that billowed upwards and realized the rising force of hot air. Fact 12: Who invented the Hot Air Balloon? His idea began to crystallize still further as his thoughts turned to the big news of the day. The Great Siege of Gibraltar (June 24, 1779 – February 7, 1783) was raging as France attempted to capture Gibraltar from the British during the American War of Independence. On September 18, 1782 the Grand Assault of Gibraltar by sea failed with huge losses to the French. Fact 13: Who invented the Hot Air Balloon? Joseph Montgolfier thought to himself that the conflict would have been settled if the troops could have come by air. He then thought back to the billowing laundry and wondered whether the power of heat could lift men off the ground into the air - and the invention of the Hot Air Balloon began. Fact 14: Who invented the Hot Air Balloon? Joseph Montgolfier conducted an experiment by building a covered box kite from taffeta and strips of wood. He then lit twists of paper beneath the box kite and watched as it rose from the table, floated upwards and bumped gently against the ceiling. He wrongly believed that the smoke itself gave the kite its buoyancy and that the smoke must contain a special gas, which he called "Montgolfier Gas". Fact 15: Who invented the Hot Air Balloon? Joseph Montgolfier reasoned that his discovery could be used to lift a flying machine in the shape of a Hot Air Balloon. Excited and astonished by his discovery he persuaded his brother, Jacques Montgolfier, to repeat the experiment and see the results for himself. Fact 16: Who invented the Hot Air Balloon? Jacques Montgolfier was sold on the idea and the Montgolfier brothers embarked on a project to build a balloon using taffeta and cordage to build a series of prototypes, starting with the original box kite shape and then moving on to balloons made from sackcloth which they eventually backed with wallpaper to hold the heated air. Fact 17: Who invented the Hot Air Balloon? The first public demonstration of the hot air balloon invented by the Montgolfier brothers took place in May 1783 before a crowd of dignitaries at their home town of Annonay. Their hot air balloon carried no passengers but their spectacular 'flying machine' flew for more than a mile in less than 10 minutes. Fact 18: Who invented the Hot Air Balloon? News of the flight spread through France and the Montgolfier brothers received an invitation to present their discovery before King Louis XVI at the palace of Versailles. Four months later Joseph and Jacques Montgolfier launched their hot air balloon at the royal court with a rooster, duck and a sheep on board - all of the animals survived unscathed and a manned flight was the next inevitable step. Fact 19: Who invented the Hot Air Balloon? Their aging father Pierre Montgolfier (1700–1793) forbade his sons to attempt to fly in the balloon, he was terrified that they would both be killed. Jacques Montgolfier was happy to obey his father but his daredevil brother Joseph Montgolfier was extremely disappointed. But out of dutiful respect to their father's wishes neither brother would fly untethered in their hot air balloon invention. Fact 20: Who invented the Hot Air Balloon? The first manned, untethered flight took place in a Montgolfier Hot Air Balloon on November 21, 1783 from the garden of the Château de la Muette, Paris. The flight was witnessed by King Louis XVI, members of the French court and by the U.S. ambassador to France, Benjamin Franklin. Fact 21: Who invented the Hot Air Balloon? Two enthusiastic volunteers, Jean Francois Pilatre de Rozier, a physicist who provided scientific demonstrations to the French court, and an army officer, Francois Laurent, Marquis d’Arlandes, became the first humans to fly. Fact 22: Who invented the Hot Air Balloon? The Hot Air Balloon was 70 feet tall, a bright blue color and decorated with gilt fleurs-de-lis. The 25-minute flight attained an altitude of 3,000 feet and travelled 5½ miles (9 km) landing at the Butte-aux-Cailles hilltop, on the outskirts of Paris. Jean Francois Pilatre de Rozier and Francois Laurent, Marquis d’Arlandes survived the flight and celebrated their success with a glass of champagne - a tradition continued by balloonists to the modern day. Fact 23: Who invented the Hot Air Balloon? On January 19, 1784 a massive Montgolfier hot air balloon carried seven passengers to a height of 3,000 feet over the city of Lyons. Fact 24: Who invented the Hot Air Balloon? Ballooning became a sensation and the Montgolfier brothers soon saw themselves superseded by the exploits of other pioneers in aviation and Joseph and Jacques Montgolfier returned to continue business at the family paper mill. Fact 25: Who invented the Hot Air Balloon? Aerial Reconnaissance began in 1860 when the American inventor Professor Thaddeus Lowe persuaded the military to use Hot Air Balloons for Aerial Reconnaissance. Fact 26: Who invented the Hot Air Balloon? Jacques Montgolfier died at Neuchâtel, Switzerland, on August 2, 1799. Joseph Montgolfier died at Balaruc-les-Bains on June 26, 1810.
Who Invented the Hot Air Balloon - Joseph and Jacques Montgolfier - Inventor - Invention - Definition - Meaning - Famous - Device - Innovation - Important - Significant - Development - Transportation - First - Definition - Kids - Amazing - Best - Facts - Information - Info - Who invented the Hot Air Balloon - Dates - When - Why - Impact - Purpose - Use - Interesting - New - Old - Definition - Meaning - Awesome - Cool - French - Who invented the Hot Air Balloon? - Hot Air Balloon History - Hot Air Balloon Timeline - Who Invented the Hot Air Balloon?